The Portland to Coast relay team included Dylan Bauer, Beau Crabill, Jack McCauley, Dylan Miller, Kaleb Dickinson-Cove, Zack Sundt, John Han, Ben Van Haitsma, Tilahun Castro, Sam Fleckenstein, Nick Rossi and Max Leung-Wagner. It is the longest and largest high school relay in the world. And Dylan Bauer is running in the wrong direction. 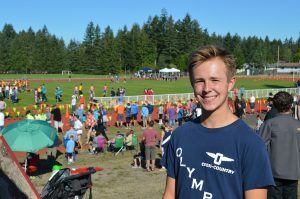 Bauer joined 10 of his teammates from Olympia High School’s cross country team and Beau Crabill, a senior runner at Capital High School, to compete in the 2016 Portland to Coast High School Challenge in late August. Starting in downtown Portland, the 130-mile relay consists of 36 legs with each athlete from their 12-member team running three rotations. 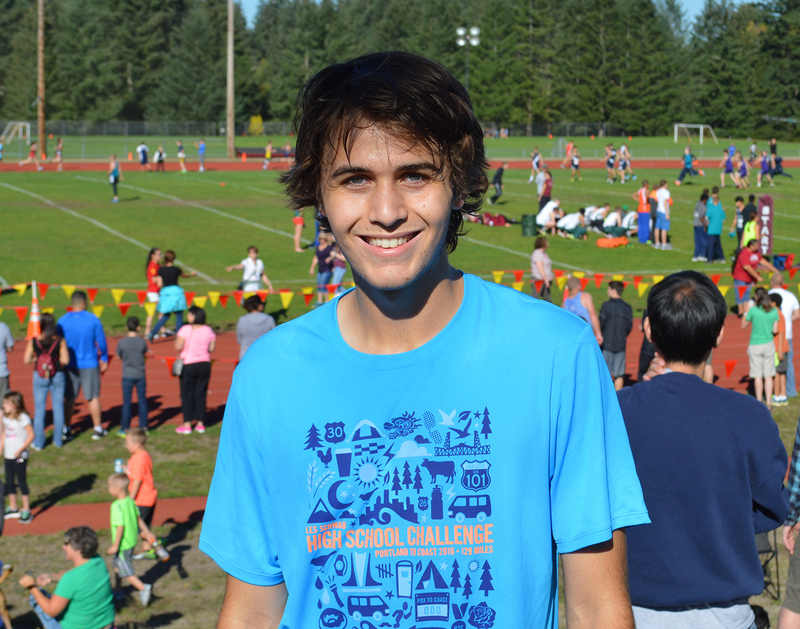 Bauer, a junior, tackled the opening leg and despite having to make up a good three miles on the competition due to some shoddy volunteer navigation, helped his squad win the event by nearly an hour over the next closest team. Joining Bauer and Crabill on the relay team were Olympia cross country runners Jack McCauley, Dylan Miller, Kaleb Dickinson-Cove, Zack Sundt, John Han, Ben Van Haitsma, Tilahun Castro, Sam Fleckenstein, Nick Rossi and Max Leung-Wagner, the lone senior for the Bears. Olympia High School junior Jack McCauley organized a 12-member team to compete in the 2016 Portland to Coast Relay, the largest high school relay race in the world. The team took first place, winning the race by nearly an hour over the next team. Photo credit; Grant Clark. The group covered the distance in a blistering combined time of 14 hours, 37.56 seconds. Teams begin the race, which starts a handful of miles into the Hood to Coast Relay, in waves with competing teams being added in intervals. Bauer and a handful of other runners kicked things off and were immediately guided in one direction to start. It turned out to be the wrong route. It marks the third consecutive year the squad has participated in the event. They finished fourth two years ago and third last year. Zack Sundt, a junior at Olympia and second-year cross country team member, participated in the Portland to Coast relay for the first time. Photo credit: Grant Clark. 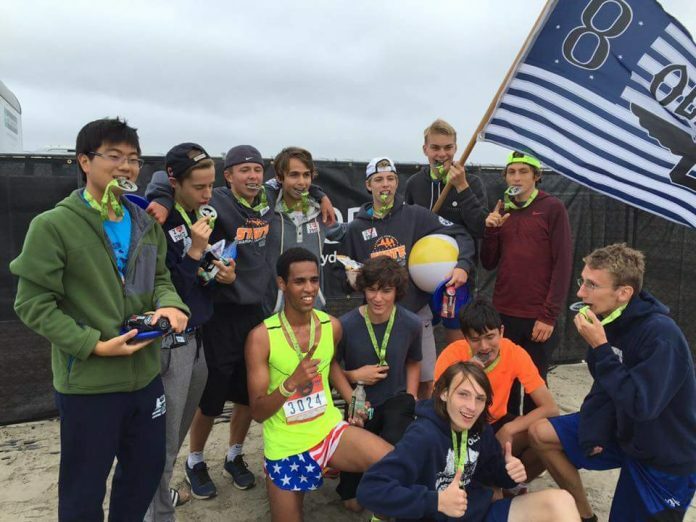 While Stevick was absent from the team’s preparation, he was present at the event, participating with his own team in the Hood to Coast Relay. Once the high school team finished, several runners immediately sought out Stevick, who has won the Capital City Marathon a remarkable 10 times out of the last 11 years – only to discover his group had yet to complete the race. 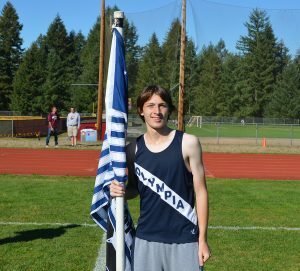 Olympia junior Dylan Bauer ran the opening leg of the relay. The 130-mile race consists of 36 legs with each team member running three rotations. Photo credit: Grant Clark. For Sundt, a junior who joined the Bears’ cross country team just last year, it was his first time running in the event. Sundt and his teammates, however, made things look easy as only one other competing high school team got within two hours of their final running time. Olympia finished 15th overall at the Class 4A state meet last year, with Miller, McCauley, Van Haitsma, Castro and Fleckenstein all competing at state. Crabill capped his junior season with an appearance at the 3A state meet, helping the Cougars finish 15th in their classification.